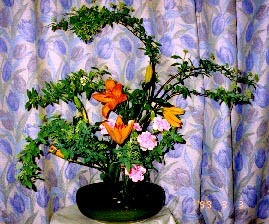 Ikebana developed well over 6 centuries ago, following the introduction of Buddhism into Japan. One aspect of Buddhist practice was the offering of flowers to the alter of the Buddha. In Japan, the priests paid careful attention to the arrangement of the offerings and elaborate styles developed. 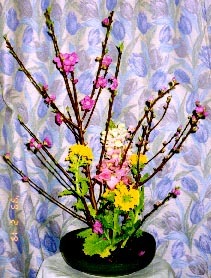 By the second half of the 15th century Ikebana had grown into a separate art form distinct from its Buddhist origins. 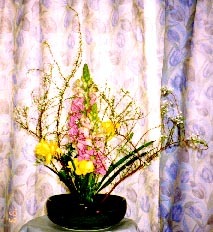 During the 16th century the tea ceremony became widespread and Ikebana was incorporated into it. 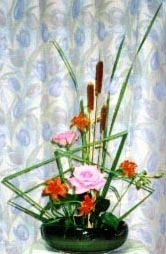 Ikebana is considered a traditional Japanese art. The artist attempts to express her own feelings as well as her impressions of nature. Sometimes this will include indications of the passage of time, such as a weatherworn branch. This helps express the idea that nature is perfect as it is. 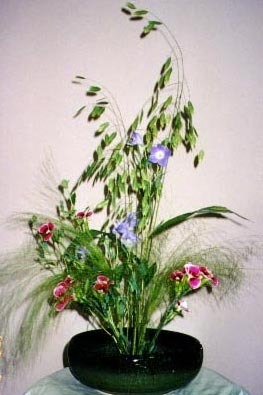 However, the artist does not simply present the flowers as they exist naturally. She also tries to arrange them in a way to give them a new meaning and expression.